Some of you advanced readers may be thinking, “Stupid! Just press ‘Print Screen’ on the keyboard! 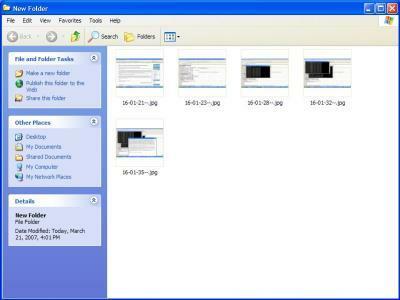 The screen dump will be copied to the clipboard. Just paste it in an imaging program like Ulead PhotoImpact, PhotoShop, Jasc, Irfanview, or even Microsoft Paint!” Yes, I could do it that way. But many don’t realize how tedious that is. In every screendump, I would have to first capture, then paste. After 5 screenshots, that manual process can get pretty tiring. What if I need to capture a spontaneous screenshot that changes every 3 seconds? I will not have time to paste and save then paste and save. When I create screen shots for my articles, I usually compliment the basic print screen button functionality with an simple automated screenshot image saving program called ScreenCopy. 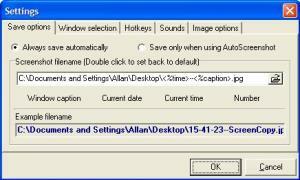 The configuration of ScreenCopy is pretty straightforward. The main options are where to save the file, the filename nomenclature (naming convention), the image quality, custom hotkeys, sound effects, and capture area. Basically, every time I hit “Print Screen,” ScreenCopy will save the screen shot on the desktop with the time and window name designated by the file name. That means I can press “Print Screen” X number of times without having to paste the data in an imaging program and saving it manually each time. That’s a huge time saver! This entry was posted on Wednesday, March 21st, 2007 at 3:14 pm	and is filed under Imaging, Utilities. You can follow any responses to this entry through the RSS 2.0 feed. You can leave a response, or trackback from your own site.